The Lemoore Union Elementary School District is using an online process to confirm your student's enrollment information. You will need to complete the data confirmation prior to receiving your student's teacher assignment or class schedule. You must have an Aeries PARENT portal account. 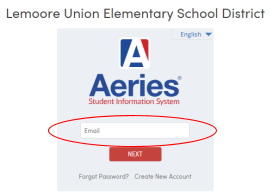 Aeries student account do not have access to data confirmation. It is highly recommended to use a computer to update your student's data. The platform is not compatible with smartphones. You cannot update your student's data with the Aeries App. If you forgot your password, use the link. Once you are logged into the Parent Portal, a yellow Student Data Confirmation banner message on the top of the screen will ask to confirm the information about your student. Please click on “Click Here” to continue to the Data Confirmation update screen. Please “Confirm and Continue” each section before moving on to the next tab. Once all the data confirmation update tabs have been updated, please click on the “Finish and Submit” button to finalize the data confirmation process. If you need assistance with the parent portal process, please email LUESDTech@myluesd.net or call the Technology Help Desk at 559-924-6837. We will answer your emails and telephone calls as soon as possible. We appreciate your patience.